What happens on the day of surgery? When should you call your doctor? Bladder augmentation is surgery to make the bladder larger and improve the way it can stretch. After surgery, your bladder should be able to hold more urine. You will probably urinate less often. 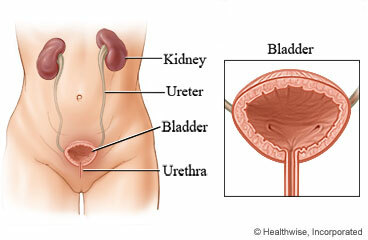 If you use a catheter to drain your bladder, you may be able to use the catheter less often. The doctor will make a cut in your lower belly. This cut is called an incision. Then the doctor will make an incision to open the top of your bladder. He or she will take a piece of tissue from your intestines or stomach. The doctor will form the piece of tissue into a patch. The patch will cover the open area at the top of your bladder. The doctor will stitch the patch in place. Then the incision in your belly will be closed with stitches or surgical staples. You will have a scar on your belly that will fade with time. Most people go home 4 to 7 days after surgery. You will probably be able to go back to work and most of your usual activities in 4 to 6 weeks. But you may need up to 3 months to fully recover. Follow-up care is a key part of your treatment and safety. Be sure to make and go to all appointments, and call your doctor or nurse call line if you are having problems. It's also a good idea to know your test results and keep a list of the medicines you take. Understand exactly what surgery is planned, along with the risks, benefits, and other options. Tell your doctors ALL the medicines and natural health products you take. Some of these can increase the risk of bleeding or interact with anesthesia. If you take blood thinners, such as warfarin (Coumadin), clopidogrel (Plavix), or aspirin, be sure to talk to your doctor. He or she will tell you if you should stop taking these medicines before your surgery. Make sure that you understand exactly what your doctor wants you to do. Your doctor will tell you which medicines to take or stop before your surgery. You may need to stop taking certain medicines a week or more before surgery. So talk to your doctor as soon as you can. If you have an advance care plan, let your doctor know. Bring a copy to the hospital. If you don't have one, you may want to prepare one. It lets your doctor and loved ones know your health care wishes. Doctors advise that everyone prepare these papers before any type of surgery or procedure. You may need to go to the hospital the day before surgery to get laxatives to empty your bowels. Surgery can be stressful. This information will help you understand what you can expect. And it will help you safely prepare for surgery. Follow the instructions exactly about when to stop eating and drinking. If you don't, your surgery may be cancelled. If your doctor told you to take your medicines on the day of surgery, take them with only a sip of water. Take a bath or shower before you come in for your surgery. Do not apply lotions, perfumes, deodorants, or nail polish. Do not shave the surgical site yourself. Take off all jewellery and piercings. And take out contact lenses, if you wear them. The area for surgery is often marked to make sure there are no errors. You will be kept comfortable and safe by your anesthesia provider. You will be asleep during the surgery. The surgery will take about 3 hours. Be sure you have someone to drive you home. Anesthesia and pain medicine make it unsafe for you to drive. You will be given more specific instructions about recovering from your surgery. They will cover things like diet, wound care, follow-up care, driving, and getting back to your normal routine. You have questions or concerns. You don't understand how to prepare for your surgery. You become ill before the surgery (such as fever, flu, or a cold). You need to reschedule or have changed your mind about having the surgery. Enter Z097 in the search box to learn more about "Bladder Augmentation: Before Your Surgery". ©2006-2018 Healthwise, Incorporated. Healthwise, Healthwise for every health decision, and the Healthwise logo are trademarks of Healthwise, Incorporated. Care instructions adapted under license by your healthcare professional. If you have questions about a medical condition or this instruction, always ask your healthcare professional. Healthwise, Incorporated disclaims any warranty or liability for your use of this information.